Imagine a world without brand-name products! Before the Industrial Revolution it was not possible to produce enough of the same item to have a brand, but in 100 years the world changed from make-your-own everything to a society of manufactured goods. 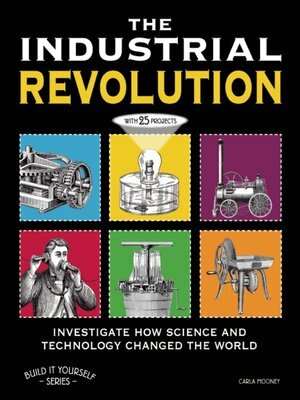 The Industrial Revolution: Investigate How Science and Technology Changed the World introduces the dynamic individuals who led this revolution and how their innovations impacted the lives of everyone, rich and poor, city-dwellers and farmers alike. Elements of history, biography, civics, science, and technology combine with activity-driven enrichment projects that kids can do with minimal supervision. Activities include creating a water-powered wheel, designing a steam ship, building a telegraph machine, and making a pinhole camera.